Marc Weingarten focuses his practice on shareholder activism, mergers & acquisitions, leveraged buyouts, corporate governance, securities law and investment partnerships. Marc serves as co-chair of the firm’s global Shareholder Activism Group and is also a member of the M&A and Securities Group and the Investment Management Group. 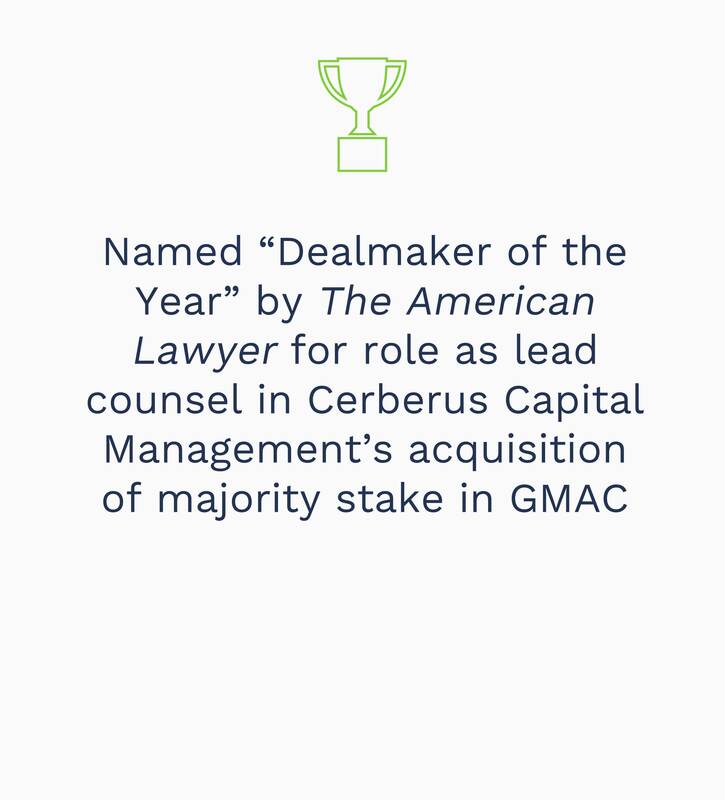 He was selected twice as “Dealmaker of the Year” by The American Lawyer for his representation of Cerberus Capital Management in its acquisition of a controlling interest in GMAC from General Motors and most recently for his work on some of the fiercest shareholder activism campaigns and proxy contests in the market. He also represented Cerberus in the acquisition of control of Chrysler from Daimler; its acquisition, by tender offer, of a controlling interest in Aozora Bank in Japan; and in numerous other transactions. He has represented private equity fund Castle Harlan in the organization of LBO funds and the negotiation of buyouts of restaurant chains, a media company, an insurance company, publishing ventures and other transactions. In addition to representing public and private companies in acquisitions and dispositions, he regularly counsels investors and companies on corporate governance and control issues. 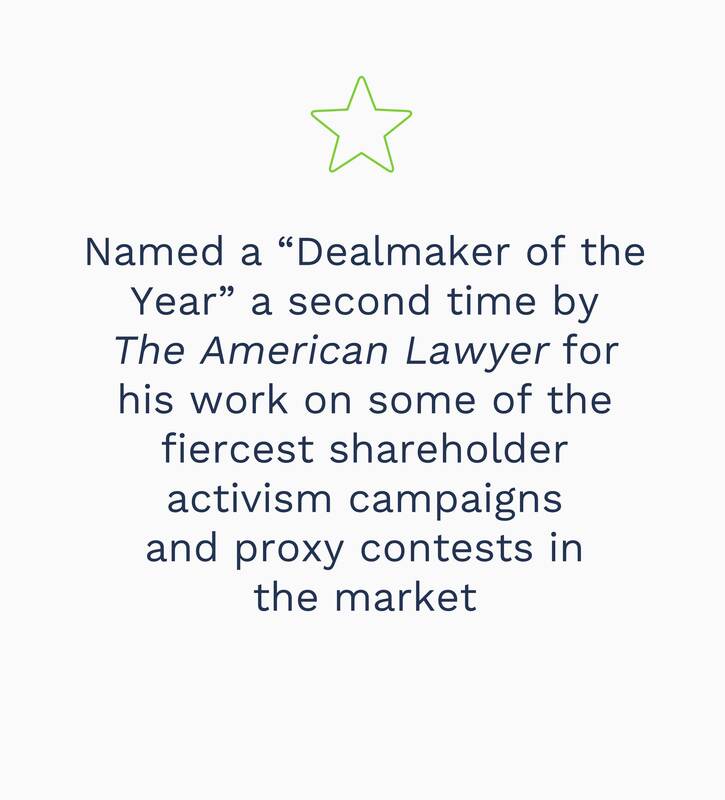 One of the leading lawyers representing activist investors, he has advised on many of the most significant activist campaigns, including The Trian Group in its successful proxy contests with Procter & Gamble and H.J. Heinz Co., The Children's Investment Fund in its successful proxy contest with CSX Corp., JANA Partners and SAC Capital in their campaign involving Time Warner Inc., Elliott Management in many of its successful campaigns, JANA Partners in all of its many successful campaigns and Greenlight Capital in its campaign involving General Motors. Marc is a member of the American Bar Association, the New York State Bar Association and the New York City Bar Association, having served on its Committee on Mergers, Acquisitions and Corporate Control Contests for multiple terms, and on its Committee on Corporation Law. He has been cited for his preeminence in both corporate law and investment fund practice in Chambers USA, IFLR1000, The Legal 500 US, Lawdragon, Who’s Who and New York Super Lawyers. Marc received his J.D. from Georgetown University Law Center, where he was an editor of the Georgetown Law Journal, and his B.S. in finance from the University of Pennsylvania's Wharton School. Represented Cerberus Capital Management in the acquisition of an 80-percent interest in Chrysler from DaimlerChrysler. Represented Cerberus Capital Management in the acquisition of control of GMAC from General Motors. Represented Cerberus Capital Management in its acquisition of Caritas Health Care, a transaction named by Investment Dealers' Digest as the 2010 “Deal of the Year” in the health care category. Organized and represented Castle Harlan LBO funds in negotiated buyouts of restaurant chains, media company, insurance company, publishing ventures and other transactions. Represented JANA Partners and SAC Capital in activist campaign involving Time Warner Inc. Represented the Children’s Investment Fund Management in its campaign involving CSX Corp. Represented Cerberus Capital Management in the acquisition by tender offer of a controlling interest in Aozora Bank in Japan. Represented Pershing Square in its investments in McDonald’s and Target Corp. Represented Trian Group in proxy contest involving HJ Heinz Co. Represented Mustang Capital Management in a successful activist campaign involving Furmanite Corporation. Represented SRS Investment Management in a successful activist campaign involving Avis Budget Group Inc. Represented Altimeter Capital Management LP in connection with its investment in United Continental Holdings Inc. Represented Elliott Management in a successful activist campaign involving PulteGroup Inc. Represented Prudential Securities, Inc. as underwriter in initial public offerings and high-yield debt financings of media companies. Represented JANA Partners in activist campaign involving Kerr-McGee. Represented CIT Venture Capital in LBOs of plastic specialty manufacturer, ticket printer, home improvement supplier, foundry and other transactions. Represented Sport Brands International in the acquisition of the worldwide operations of Fila Sport Group. Represented issuer in initial public offering of Brazilian cable television operator. Represented Cerberus Capital Management in the acquisition of Guilford Mills, Inc.; subsidiaries of Newell/Rubbermaid; investment in Air Canada; acquisition of division of Pitney-Bowes; proposed acquisition of Clayton Homes. Represented PCA Corp. in acquisition of ASI Corp. and in sale to LBO fund. Represented American List Company in sale to Snyder Communications. Represented CIT Group in its acquisition of Newcourt in Canada. Represented Circa Pharmaceuticals in sale to Watson Pharmaceuticals. Represented Monro Muffler in acquisitions, corporate matters. Represented investor group in successful proxy contest for Alliant Tech Systems, and represented Alliant in public and private financings and in acquisition from Hercules, Inc. Represented Caribiner International, Inc. in initial and secondary public offerings, acquisitions and other transactions. Represented Morton’s Restaurant Group in IPO and secondary offerings, proxy contests, acquisitions and dispositions, high yield refinancing. Represented bidder in hostile contests (proxy contests, consent solicitations, and tender offers) involving Burlington Industries, Fruehauf, Telex, Centel, Morse Shoe, Rexham, William Carter Company, Dataproducts, Canal Randolph, Datapoint, MAI, Ponderosa. Represented activist investors in numerous campaigns involving board representation (including proxy contests), withhold votes, sale proposals. Represented buyer in acquisition of DiGiorgio Corporation. Represented Soros Group in various transactions. Represented acquirer of the Pilgrim Group Mutual Funds. Represented limited partnerships in formation of LBO funds, venture capital funds, hedge funds, etc. Schulte Advises Voce Capital Management LLC in Nomination of Four Directors to the Board of Argo Group International Holdings Ltd.
Schulte Advises Voce Capital Management LLC in Securing Two Board Seats at Natus Medical Inc.
Can Activist Hedge Fund Managers Provide Special Compensation to Nominees That Are Elected to the Board of a Target? Marc Weingarten Interviewed by Bloomberg TV’s "Inside Track"